Scholar, spiritual teacher and provocateur Marc Gafni is shaking the landscape with this inspired call for the Democratization of Enlightenment as the critical next step in the Evolution of Consciousness necessary to the chart the next step in history. Gafni uplevels our understanding of the self, introducing for the first time in history a vision of enlightenment that can go mainstream and change something essential in the source code of consciousness. Your Unique Self features both a Foreword and Afterword by Ken Wilber, the eminent psychological theorist, mystic, and authority on Integral philosophy. 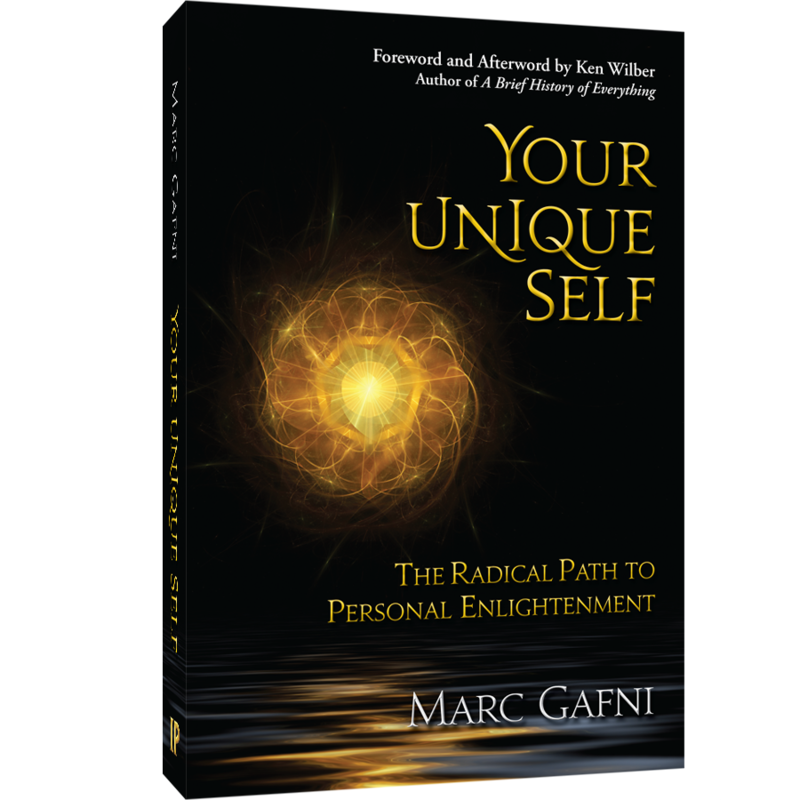 Michael Murphy, icon of the human potential movement, said that this is one of those once-in-a-generation books with such power and insight that it literally changes the game. With Your Unique Self, Dr. Marc Gafni offers a paradigm-shifting investigation into the nature of spiritual awakening and the underlying purpose of human existence. Your Unique Self dramatically evolves how we define enlightenment and an enlightened life in a way that gives every human the genuine possibility of realizing their own unique evolution. Gafni is a key leader in a movement actively inviting us to “the democratization of enlightenment” as the most important potential shift in the evolution of human consciousness. According to Gafni, only such a radical re-thinking evolution of consciousness will give us the resources we need to successfully navigate the immense challenges we face at the next stage of evolution. Until this book, Western teachings about individuality and achievement and Eastern teachings about moving beyond our individuality to become merged with the one offered us completely opposing directions for growth and realization. In this sweeping tour de force, Gafni not only dazzles minds and penetrates hearts, but he offers an integrated and radically exciting approach that merges the Western idea of individuation and progress with the beautiful Eastern-based philosophies of becoming one with All-That-Is. With a mixture of deep insight, audacity, and infectious exuberance for all of existence, Gafni’s new vision of enlightenment does the impossible: he liberates enlightenment from the esoteric discourse of spiritual elites and makes it a genuine option and compelling path in the very heart of mainstream culture. Moreover he evolves enlightenment in such a way that is both faithful to the deepest wells of the great traditions even as it is passionately modern and post modern and contemporary. Whereas we once believed that to be enlightened was a process of evolving beyond your experience of being a skin encapsulated ego, your separate self, in order to realize your essence as indivisible from the seamless coat of the universe. This is actually the first stage of a much greater journey, reveals Marc Gafni. What unfolds next is the powerful awakening to your Unique Self. This is the realization of your true uniqueness as the highest expression of enlightenment. Enlightenment means not only to wake up to the face that beneath your personality you are essence but rather beneath the grasping of your ego is your infinitely unique and special personhood that is no less than the personal face of essence. In your enlightenment you realize that God is having a You experience. This book speaks dangerous words, writes Marc Gafni. Dangerous to your sense that you are smallto your feeling that you are invisible or alone. Your Unique Self dares you to listen dangerously to embrace your greatness and open to the infinite love intelligence that yearns to enter the world as you. Gafni’s book may well be the tipping point that makes spirituality a path of choice for the best and brightest among us.